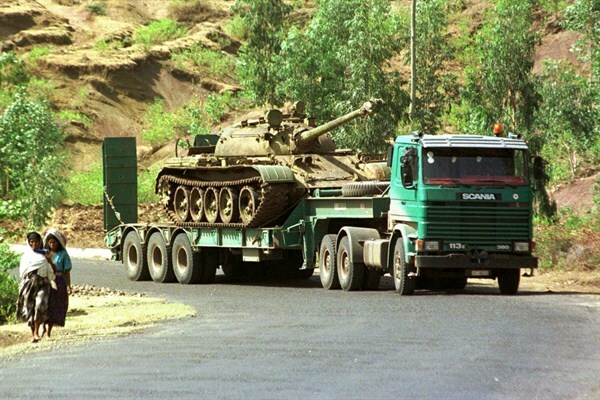 An Ethiopian tank heads for the frontlines during the Ethiopian-Eritrean War, June 25, 1998 (AP photo by Sayyid Azim). On June 12, an uneasy peace between Ethiopia and Eritrea that had lasted 16 years came to a dramatic end, as border clashes claimed 200 Ethiopian lives and an unknown number of Eritrean casualties. While both countries blamed each other for escalating hostilities, the causes of current tensions differ markedly from those underpinning past wars between them, with implications for efforts by international partners seeking to mediate between the two sides. Historically, conflicts between Ethiopia and Eritrea have been triggered by territorial disputes and national security concerns. The 30-year war that lasted from 1961 to 1991 was a struggle for Eritrean independence, sparked by Ethiopia’s revocation of the then-province’s legally granted autonomy. Their 1998-2000 war, which resulted in 80,000 casualties, was a similarly intense struggle for control of the disputed border town of Badme. More recently, border skirmishes in 2012 were triggered by Ethiopia’s allegations that Eritrea was supporting terrorist attacks by Ethiopian Afar rebel groups. In stark contrast to previous conflicts, however, the recent hostilities between Ethiopia and Eritrea are largely rooted in internal politics on both sides. Ethiopia and Eritrea are both ruled by authoritarian regimes, beset with internal discord and economic crises. Limited border hostilities are an effective way for the leaders of both countries to rally pro-regime nationalism and strengthen their holds on power. Ethiopia’s rationale for escalating tensions with Eritrea can be explained by three factors. First, Ethiopia is struggling to recover from its worst drought in three decades. An estimated 15 million Ethiopians are in need of urgent food aid, with the central and southern regions of the country suffering most acutely. Despite United Nations reports of two infants dying every day in the worst-affected regions, Ethiopian Communications Minister Getachew Reda has resolutely denied the famine. His denials resemble the conduct of past leaders like Emperor Haile Selassie during the 1973 famine and junta leader Mengistu Haile Mariam during the 1983-1985 drought, which claimed at least 400,000 lives. In stark contrast to previous conflicts, the recent hostilities between Ethiopia and Eritrea are largely rooted in internal politics on both sides. To distract Ethiopians from food shortages and deflect international criticism of Ethiopian Prime Minister Hailemariam Desalegn’s handling of the famine, the Ethiopian government has inflamed border tensions with Eritrea. Desalegn’s military aggression during a period of famine also has historical precedents. From 1978-1986, the peak years of food shortages, Mengistu launched 8 major offensives against Eritrean separatists. Second, Desalegn could be escalating tensions to gain access to international military and financial assistance. Ethiopia has cooperated closely with Somalia on counterterrorism since Desalegn became prime minister in 2012, and still has troops in the country as part of a multinational African Union force fighting the Islamic State-allied Al-Shabaab insurgency. Ethiopia could conceivably request Western assistance, using the border tensions to justify the need and Addia Ababa’s continued support in Somalia’s struggle against the terror organization as leverage. Third, the Desalegn government is using conflict with Eritrea to rally pro-regime nationalism and deflect attention from grievances of Ethiopia’s Oromo population. In recent years, the Oromo have become increasingly resistant to the political hegemony of the Tigrayan minority, which constitutes 6 percent of Ethiopia’s population. In response to this unrest, the Ethiopian regime has become increasingly repressive toward the Oromo, who make up almost 50 percent of Ethiopia’s population. Incarcerations of dissident Oromo have risen and have been justified based on dubious terrorism linkages. Ethiopian security forces have killed an estimated 400 Oromo since November 2015 during protests over a planned urbanization expansion that encroached on Oromo land. This gratuitous violence has triggered anti-regime protests, which Ethiopia accused Eritrea on Feb. 26 of orchestrating in order to create turmoil in Addis Ababa. The instrumental linkage of Eritrea with domestic terrorism appeared during the 1998-2000 conflict, and has been a frequent theme in Ethiopian propaganda ever since. It has also been highly effective in justifying Addis Ababa’s current military escalations against Eritrea. Through border skirmishes, the Ethiopian regime is trying to rally its people around a common Eritrean enemy and transcend sectarian divides. Eritrea’s willingness to escalate hostilities with Ethiopia can be explained by President Isaias Afewerki’s need to deflect from growing criticisms of his human rights record and his perpetual militarization of Eritrean society. On June 8, the U.N. published a scathingly critical report on human rights in Eritrea that described Afewerki’s use of indefinite forced conscription as a crime against humanity. In the aftermath of the U.N. report, 10,000 Eritreans residing in Europe protested in Geneva, urging the international community to further isolate the Afewerki regime. They also petitioned the International Criminal Court (ICC) to indict Afewerki in line with U.N. recommendations. Even though Reporters without Borders has rated Eritrea at the bottom of its press freedom rankings for eight consecutive years, Eritreans have become increasingly vocal in their opposition to Afewerki. On June 23, hundreds of Eritrean dissidents and refugees protested in Addis Ababa against his regime. Passive resistance to Afewerki’s militarization policy has also increased. In late 2014, the Eritrean government’s forced conscription program in Asmara unraveled, as only 50 conscripts out of the 400 drafted appeared for duty. This has increased Afewerki’s dependency on Tigrayan Ethiopian mercenaries to maintain Eritrea’s security. These paramilitary forces have been vital for Afewerki’s survival, as they share his ethnic identity and are more loyal than national military forces, which attempted a mutiny against his regime in January 2013. In light of growing internal discontent, inflaming tensions with Ethiopia could be an effective way for Afewerki to restore the loyalty of his military and reduce his dependency on sectarian militias. On June 22, the Eritrean government accused Ethiopia of trying to instigate a full-scale war against Eritrea. Eritrea’s ambassador to Kenya, Beyene Russom, claimed that Ethiopia was engaging in belligerence to capitalize on the turmoil created by the U.N. report. By accusing Ethiopia of threatening Eritrean independence, Afewerki can rally nationalist sentiments to strengthen his hold on power. Despite popular discontent, many Eritreans hold Afewerki in high esteem as a national liberator, due to his leadership role in the Eritrean People’s Liberation Front (EPLF). Therefore, a military confrontation with Ethiopia could evoke memories of the independence war and strengthen Afewerki’s legitimacy. Frequent references to the 1998-2000 war from members of Eritrea’s senior military command also justify Afewerki’s military mobilization to protect Eritreans from future Ethiopian aggression. By re-inflaming the border conflict, Afewerki can also justify non-implementation of the 1997 Eritrean Constitution, and in particular Eritrea’s lack of progress toward democratic reform, on security grounds. In short, recent hostilities between Ethiopia and Eritrea differ markedly from past conflicts and appear to be largely driven by internal political concerns in both countries. Ethiopia’s need for foreign capital and Eritrea’s desire to restrict refugee outflows will likely prevent a new war on the Horn of Africa, though border skirmishes could persist for the foreseeable future. Western policymakers must overcome their reluctance to chastise their traditional ally, Ethiopia, on human rights abuses and show solidarity with U.N. attempts to further isolate the Eritrean regime. A credible threat to suspend economic investment in Ethiopia and hold Eritrea’s leaders responsible for their crimes in the ICC could provide the necessary leverage on the leaders of both countries to defuse hostilities and finally work toward signing a durable peace agreement. Samuel Ramani holds a master’s degree in philosophy from St. Antony’s College, University of Oxford. He is also a journalist who contributes regularly to the Huffington Post, The Washington Post and The Diplomat, among other publications. He can be followed on Facebook atSamuel Ramani and on Twitter at @SamRamani2.